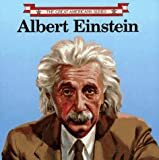 Albert Einstein / by Pamela Zanin Bradbury ; illustrated by James Seward. Series: Great Americans series: Publisher: New York : Little Simon, c1988Description:  p. : col. ill. ; 21 cm.ISBN: 9780671647674.Report number: BBSubject(s): Einstein, Albert, 1879-1955 -- Juvenile literature | Physicists -- Biography -- Juvenile literatureAbstract: This biography tells the fascinating life story of one of America's most famous scientists, Albert Einstein. Authentic illustrations, from the Library of Congress, the National Archives and the National Portrait Gallery, together with easy to read, straight forward text, create an appealing book for scholars of all ages. For grades 2-5. This biography tells the fascinating life story of one of America's most famous scientists, Albert Einstein. Authentic illustrations, from the Library of Congress, the National Archives and the National Portrait Gallery, together with easy to read, straight forward text, create an appealing book for scholars of all ages. For grades 2-5.